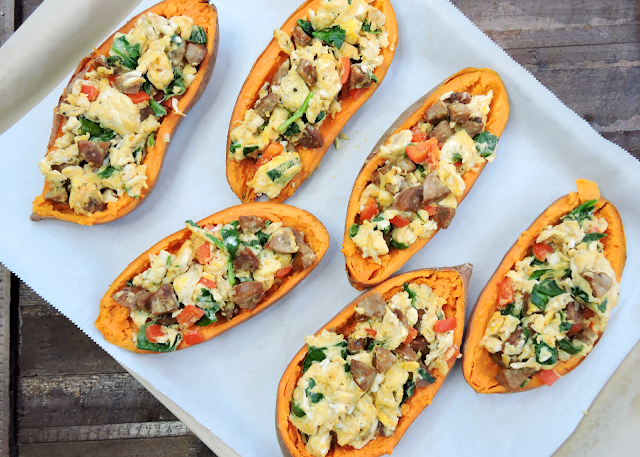 Today I'm sharing one of my favorite new breakfasts to "meal prep"... just in time for Sunday! I microwaved the sweet potatoes to keep things quick & simple, then scooped out the insides. Save them~ because they're perfect for a quick sweet potato mash with dinner (just add grass-fed butter & cinnamon). The sweet potato "shells" are then ready to be stuffed with a deliciously smokey-savory breakfast scramble of chorizo sausage, eggs, and veggies. The mix of protein and carbs makes for the perfect nutritious breakfast that will keep you full all morning. I made a batch of these for our Sunday brunch, then wrapped each leftover potato in foil & saved them for the next couple of mornings. All they needed was a minute in the microwave, & breakfast was done. Scrub the sweet potatoes, poke a few small holes in them, and wrap each one in a damp paper towel. Microwave for 4 minutes on each side, then add one more minute at a time until they are soft. Cut the sweet potatoes in half, lengthwise, and use a spoon to scoop out the center of the potato. * Leave about 1/4" of potato on the skin. Whisk the eggs and spices in a medium bowl, and set aside. In a large skillet, cook the chorizo sausage* & bell pepper for 3-4 minutes, or until the sausage is browned. Move the sausage & pepper to the edges of the pan, and pour the eggs in the middle. Stir in the chopped spinach, and scramble until the eggs are cooked. 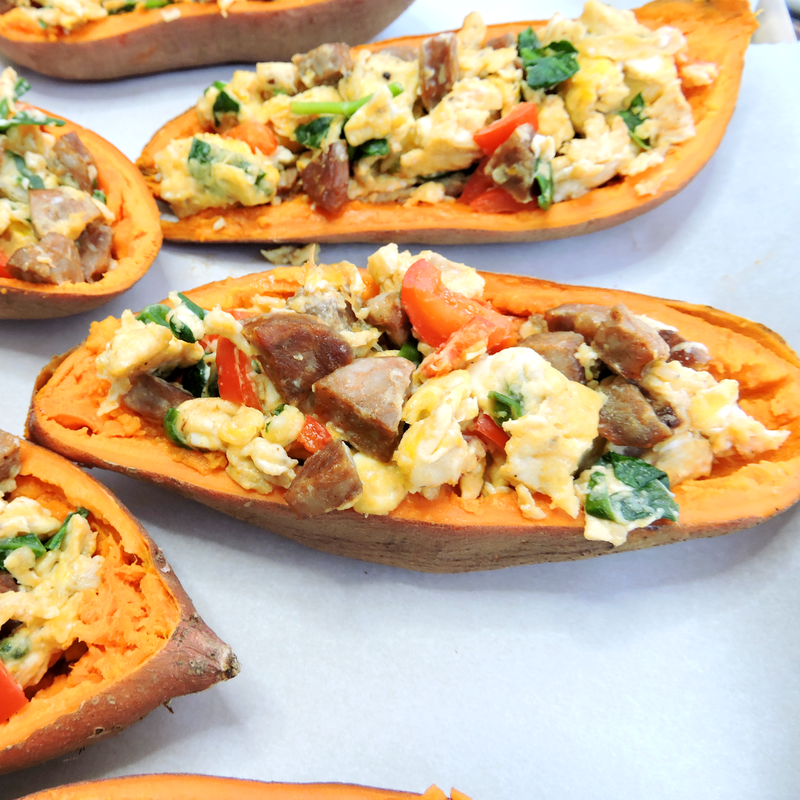 Distribute the scrambled mixture into the sweet potatoes, and lay on a baking sheet. Bake at 400ºF for 8-10 minutes, to warm them through. Serve hot with hot sauce & avocado. 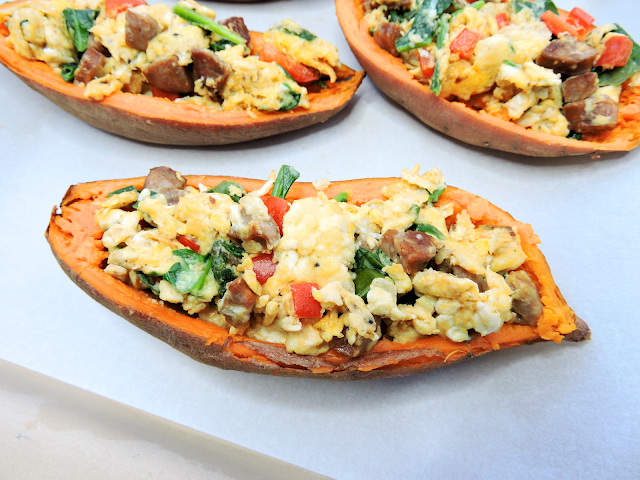 Save leftovers in the fridge for an easy reheated breakfast throughout the week! Save the flesh of the potatoes for "mashed sweet potatoes"! If you're using raw chorizo, remove the casings and cook until crumbled and cooked through. If the chorizo is fully cooked, dice it into small pieces first then cook until lightly browned.